I do my major grocery shopping every two weeks. I do make a two or three trips in between which is usually for more fruits, vegetables, eggs and milk. I usually plan my menu for the next two weeks then I will write down the ingredients needed to cook those meals in the My Shopping List app. I love this app because it’s simple and straight forward. It allows me to make several lists and to check off each item which is then removed from the list. I’ve tried a lot of grocery shopping apps and for me this works best. I purchase items like meat, snacks(chips, crackers), cleaning and baby products at Walmart. I then head to the Farmers Market for fruits, vegetables, eggs, milk and all other items. At first I didn’t think that I would be able to meal plan and actually stick to the meals as opposed to cooking whatever it was that I felt like eating that day but I have and it’s been a life saver. I have a system when deciding what to cook and it works well for me. When meal planning I use many resources such as Pinterest, Foodgawker or Instagram for inspiration. I typically cook every other day, so that would be 7 meals for 14 days. I break down those meals into categories. I have my weekend meals, which is typically more of a treat as it tends to be the fattening meals. Then I have my weekday meals which are the easier, healthier dishes; I try to cook in under an hour during the week, this gives me time to get to any other tasks that may need to be done. I will also add a meal that is similar to take-out such as homemade pizza or tacos. And lastly I will leave one or two meals which I have the option to cook whatever it is that I’m feeling like eating or to eat out. I also don’t plan what day to cook which meal, I go with whichever meal I feel like making or eating that day. I’ve been successfully meal planning for over a year and I would highly recommend it. I’ve saved money and there’s no more staring in the fridge trying to figure out what to cook and then realized that when I’ve settled on something that I’m missing one or two ingredients. Below I’ve shared my menu for the upcoming weeks and yes we eat a lot of rice. I’m thinking of adding a section to my blog where all of my menus would be available for inspiration. If this sounds like something that you would be interested in leave a comment below! 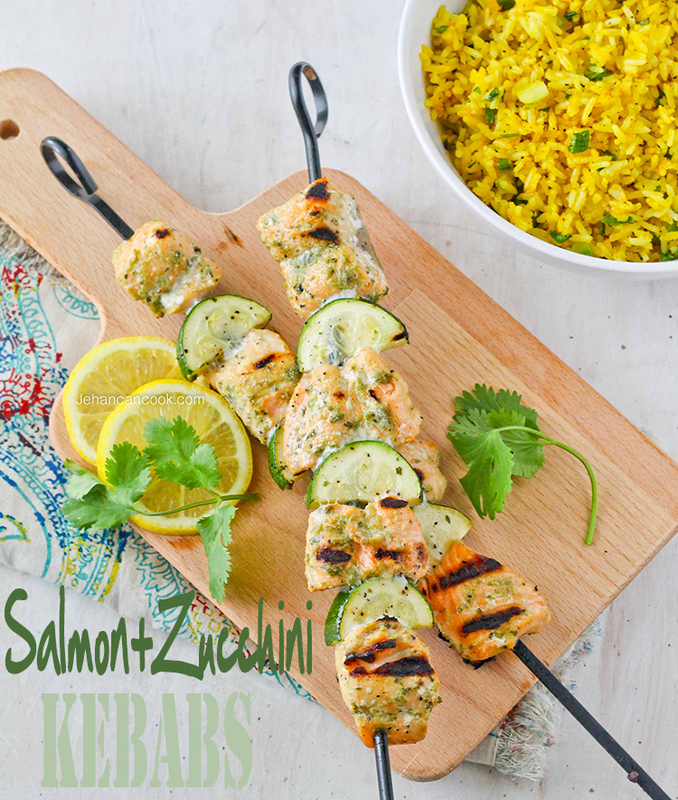 This weekend I had a few things to do so I opted to make a quick meal, so I made the Salmon and Zucchini Kebabs. This is a super simple recipe and it took less than an hour to make. It’s possible to make very flavorful meals without having to use too many ingredients or ones that are unhealthy. I always have a bottle of green seasoning in my fridge(highly recommended) and while it is typically used to season meats to add to stew and such it can also be used in a super quick marinade like the one I made for my salmon. 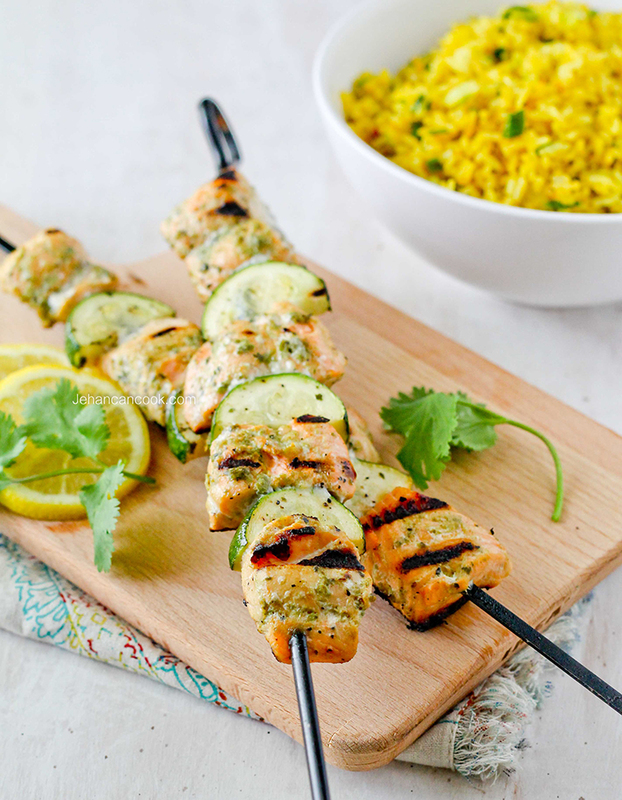 This marinade can also be used with chicken or pork! Place the salmon in a small bowl. Add lemon juice and let sit for just a minute or two; rinse. Next add green seasoning mix, olive oil, salt and black pepper to the salmon and mix well to coat evenly. 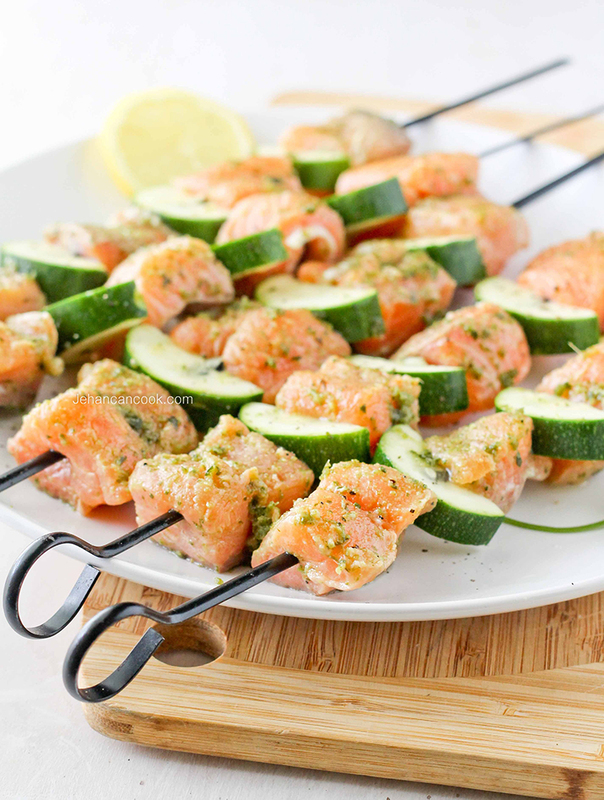 Place onto skewers alternating salmon and zucchini. I used an indoor grill so I’m going to instruct you how to use that. Heat a well oil grill over high heat until it is lightly smoking. 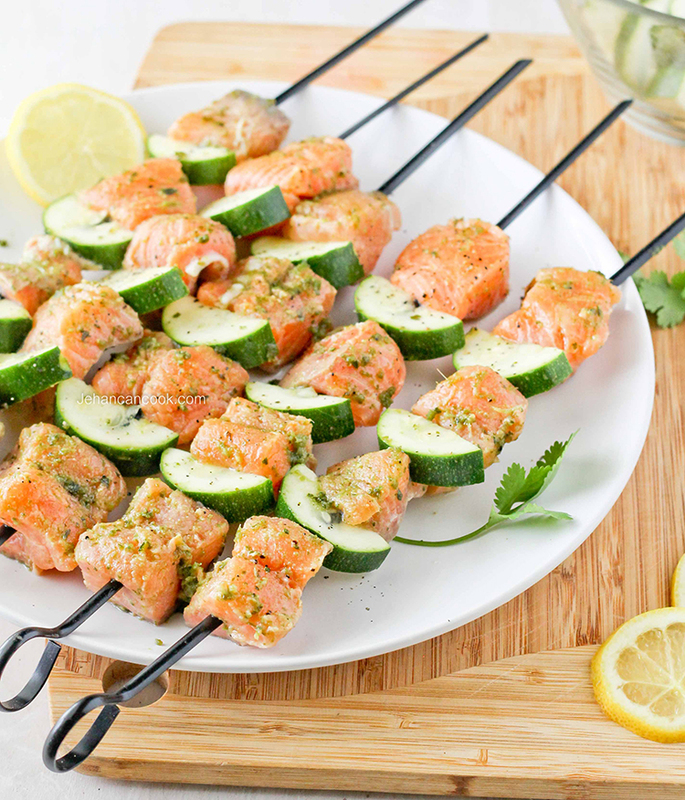 Place the salmon skewers on the grill and cook until the ends turn opaque. Do not move the salmon until you are ready to turn it, this should take about 3-5 minutes. Then flip the salmon to the other side and cook for an additional 3 minutes. If you overcook the salmon and the vegetables, the salmon will be dry and the vegetables will become mushy and fall off the skewer. *green seasoning is typically a mixture of herbs, garlic, onion and pepper. For this recipe I would recommend using thyme, cilantro, garlic and scallions chopped finely. My seasoning mix has a hot pepper added but that is totally up to you as to how hot you would like the dish to be. I WISH I WERE AT YOUR HOUSE WHEN YOU MADE THESE! Salmon is hands down my favorite food on the face of the planet and these look MAGICAL! hi jehani, i truly love the meals planning ahead and your delic recipes.